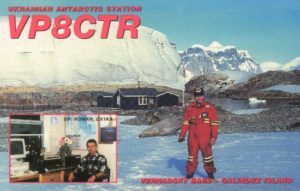 VP8CTR Wordie House, WAP GBR-Ø7 – W.A.P. Wordie House (Pic aside) was established by the British Falkland Islands Dependencies Survey on 7 January 1947, on Winter Island (65°15’S, 64°16’W). 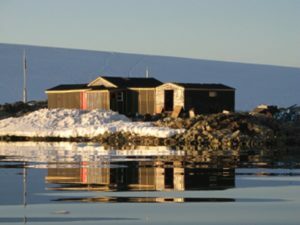 The hut is named after the chief scientist, Sir James Wordie, geologist on Shackleton’s Endurance expedition of 1914–17 who visited during its construction. The hut stands on the foundations of an earlier building, used by the British Graham Land Expedition from 1935–36. The original hut was destroyed in 1946, possibly by a tsunami. The base was renamed Faraday Station in August 1977 in honor of British scientist Michael Faraday. In May 1954, the base moved to the present site on adjacent Galindez Island where the main building was named “Coronation House”. Station “F” Faraday was referenced by WAP Worldwide Antarctic Program, as WAP GBR-Ø6. In February 1996, Ukraine took over the operation of Faraday Base “F” which was sold by the UK for a symbolic one pound. The cost of disassembling the base with good environmental practices and standards would be too costly. Wordie House (WAP GBR-Ø7) has been restored and is designated as Historic Site and Monument No. 62 and now is a BAS Museum. The key to the Wordie House is held by the Vernadsky Base Commander.